Nothing says Happy Christmas like a dead sheep being pecked by a gull. I'm so exhausted I don't have the energy to pretend the sheep is having 'a little lie down'. That sheep is dead and so will all of us be soon, happy Christmas! Now, I'm guessing that might not be the most winning sentiment for a Christmas card, so you have to start looking for a reason why Mr Farquharson painted it. It is obviously from the genre of despair, possibly making some comment about a lost sheep, in the religious sense. The 'waste of snow' may hint at our condition without God. It looks a little chilly. Famously, Holman Hunt pictured imperilled sheep, who have been allowed to stray by a useless shepherd. These are about to drop off a cliff rather than freeze to death and be pecked, but the result is the same. Without guidance and protection, we are lost. Mr Farquharson did a nice run of 'sheep in snow' pictures, with actual alive sheep, which is a bit more cheery, plus a lot of images of rivers, trees and landscape of Scotland. I find it interesting that for the Victorians, even the Scottish Victorians, Scotland is more often than not shown as being beautiful but bleak, a country that beats its inhabitants. The landscape looks punishing, and anyone who lives there looks like it could go either way. There are images of floods, of hard winters, of clearance. Very few images seem to be specifically of the Lowlands, rather painters concentrated on the more spectacular Highlands. 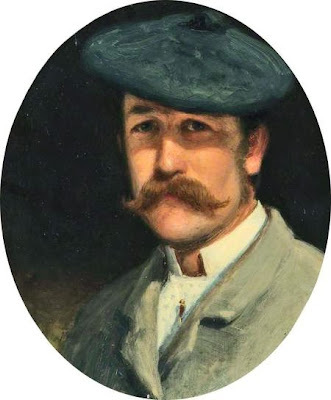 The Victorians were in the grips of three great writers who formed that idea of Scottishness that we think of now: Burns, Stevenson, and the aptly named Scott. Together with Queen Victoria's adoration of the Scotland and everything Scottish (hello Mr Brown! ), the fascination with our northern neighbours took root. It strikes me that the Victorian period also sowed the seeds for a less useful view of Scotland. Until the 19th century, it would be easy to argue that Scotland was our intellectual superior. It was involved politically and intellectually in Europe and the world stage. Scotland's involvement in the eighteenth century Enlightenment was impressive, and its part in Tudor politics was forceful and active. By the time that we reach the Victorians, we have a conflicting image of a proud past and a present where the people are seen like the favourite 'children' of the Queen. It becomes a place to go to escape modern life, to get back to nature among more primitive people. The wonderful thing about Scotland becomes how flash it makes England look. No wonder they want their independence. Anyway, stay warm and try not to wander off before tomorrow. The gulls are always waiting. Or something. Very interesting article. It is always interesting to know things like the painted/written Scotland versus the real place, I have heritage from both Scotland and England, so things like that fascinate me. I do rather like that Weary Waste of Snow picture, but I do have a bit of a dark taste. 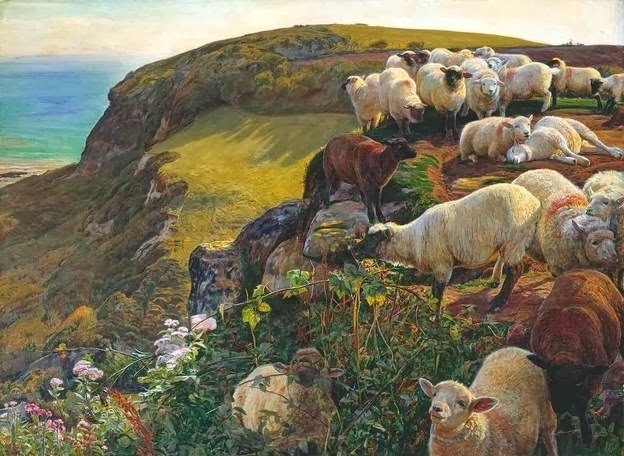 The Holman Hunt one seems positively cheery in comparison, with that warm sunlight, I am more inclined to think the sheep are happily tottering to freedom after pushing their shepherd off a cliff. Ha ha. 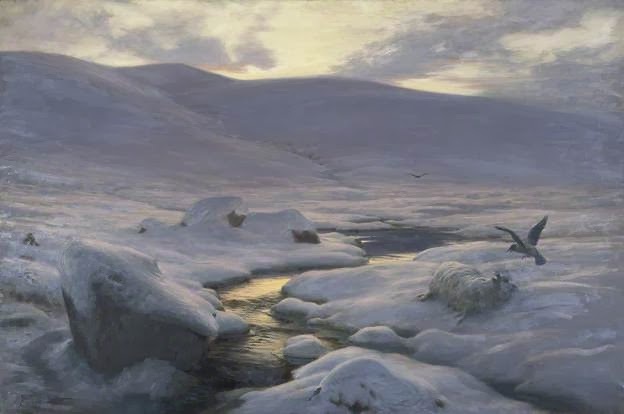 Love the Farquharson, 'The Weary Waste of Snow'. Haven't seen that one before! Thanks as always for educating me, you always have something fascinating to say. 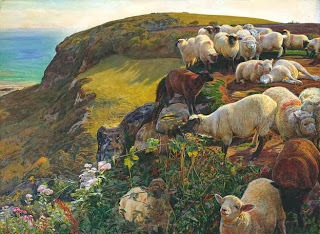 Holman Hunt's sheep do look very suspicious, you're right! Murderous baa-lambs! I live in the Highlands, and this year there has been a dearth of snow! I've got friends in Aviemore, where it's all snow-sport orientated, and I can't imagine that business is doing well. However, we have been on the receiving end of high winds, and this is not something that extraordinary in my time up here - the first winter I was here, we had winds of over 150mph! Every year since, I have been battered by gales. I will say the moors and bens can look bleak whatever the weather is doing - I've been doing conservation work on them in the height of summer, and the sheer openness of the landscape in places, especially where you've got large expanses of short scrubby stuff on massive slopes rather than trees and whatnot, does have a sense of bleakness. But I like it. The more wooded areas look a lot more "Middle Earth" than bleak - especially when you come across a castle perched by a loch (Eilean Donnan) or some craggy ruin (Urquhart castle) or a group of ancient tombs (Clava Cairns).